It is always nice to find other beekeepers and homesteaders in the burbs’. Here is another great story from the opposite coast! Greetings from Northern California! As I write, the rain is pouring down, a real boon for our drought-stricken area. Looking outside, I can see the plants in our raised beds looking a little limp, and our chickens huddled miserably in the dry corner of their run. I can’t see any honeybees at all, though, and that’s because they are snugly huddled together in the middle of their hive, between bars full of honey! I enjoy reading Cecilia’s blog so much, for many reasons, but I think the thing I find most fascinating is the larger scale of her operation. Cecilia has many barns, pastures, and animals, spread across acreage. Heavens, she even has to zipline across a creek to reach some of them! (Ok, maybe not yet.) Reading about the size of the Farmy delights me. I had to make some changes in the greenhouse this winter which gave me the opportunity to take a closer look at my grow beds. The grow beds had a high concentration of fish solids making it difficult to maintain clean water and a proper ph balance. These tanks have been in operation for over 3 years so I guess that’s not bad considering how lax I have been cleaning the swirl filters, which removes 80% of the fish solids. Note the mud like substance in the photos as well as the algae buildup in certain areas of the grow bed. The only real option I had was to remove the grow media and rinse it through strainers to remove as much of the solids as I could before returning it to the grow bed. Hopefully I will never let it get that bad again, but I know my fish and plants appreciated the clean out. Its that time again. 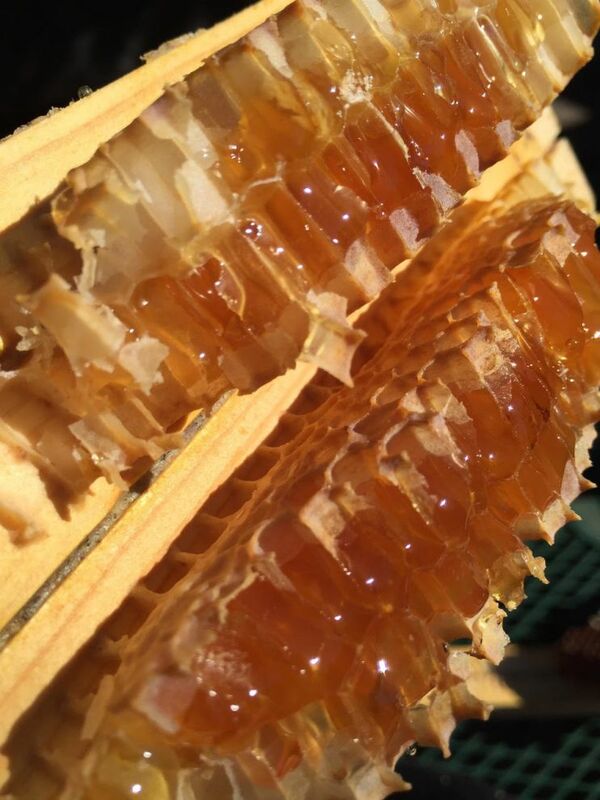 Around July 4 seems to be the perfect time to harvest our honey from the hive. I had high hopes this year, as this was the second year that this hive would give us honey, but once getting into it, I was a little let down. Last year (2015)we were able to get about 11 pounds of honey. Not a fantastic harvest, but still very excited about our first year. This year I truly expected that we would be able to harvest two to three times that amount, as the hive seemed very strong and thriving. I guess sometime in the spring, we must have had a swarm from this hive. When I opened it up, the bee population seemed very low. Unfortunately, I had my wife taking pictures while I explored the hive and none of those pictures came out for some reason. In the brood boxes, I found lots of empty cells, drone and female, along with a good amount of brood. There was a layer of pollen and honey, so the house bees seem to be keeping up on their duties. I did not find any queen cells, so the hive is not “thinking” about a new queen. I am guessing that this queen is starting to fail (I did not re-queen in 2015) so I am going to get a new queen and make that change now, so there will be plenty of time to assimilate and grow winter stores. Back to the honey. I did get almost the same amount of honey this year as I did in 2015, so I guess I can’t complain too much. I will say the honey this year was much darker, so they must have got nectar from a different source than last year. I will be adding 2 more hives in the spring, so I look forward to the coming years of beekeeping. Please enjoy some of the pictures from our day. Solar.SaveGreenGoingGreen.netIt has been almost 2 months since we had the solar panels installed. We have a website to monitor the production on a daily basis and I must say I am pretty happy with the first few weeks-even with all the cloudiness and rain. In April, which we were only live about 20 days and most of those days were deluged with rain, we were still able to produce 291.5 kw of energy through the solar panel. I would say this is not too shabby of a start. So far in May (Through May 28 2016) we have produced 310.69 Kw. Still a little low, but as you can see from the graph below, we have still had a lot of clouds and rain. Our highest day production was 22.07 KW on May 16th. If we could produce 20 Kw a day for an entire month (600Kw for 30 days) This would run my greenhouse without issue, never having to pull extra energy from the grid. Comparatively, my electric bill from the local utility (Baltimore Gas & Electric, BGE) for LAST YEAR AT THIS TIME due June 1, 2015 was a total od $280. I received my bill this year and it was for $195-a total reduction of $85. This is a reduction of 396 Kw from last year overall, but since I cannot know the exact days to calculate to compare apples to apples, meaning I do not know the exact reading dates that are accounted for in billing. If I did, I could calculate how much energy I produced in solar for the exact same days-giving me a very good picture of how we are doing. I will be tracking our progress as I want to be able to have accurate information for anyone who may be thinking about going solar. This last year has seemed to quadruple in speed. So much has happened and changed that I did not even realize how much I have neglected my aquaponics systems in the greenhouse. You know you have not been paying attention when you find moss growing on your grow media! The grow bed above “B” tank in my greenhouse has collected a large amount of fish poo in the grow media, allowing for moss growth on top and around all the edges. Honestly this past winter, I did not grow much in this bed and kept feeding the fish as normal. The tank is currently over-crowded with about 30 adult tilapia fish, which produce a large amount of waste. I have a swirl filter attached to the system to help eliminate heavy solids, but I have not kept up with cleaning and draining the swirl filter on a regular basis. The swirl filter with an over-populated tank should be drained every other day and cleaned about once per week. Through the winter, I probably drained it every 2 weeks and cleaned the filter once a month-very neglectful on my part. Truly I am surprised I have not lost fish from the tank as the ammonia levels are way out of control. I dug down into the grow media a few inches and found the majority of fish waste was contained in the top 2-3 inches of the media. I took off the top few inches and rinsed it thoroughly before replacing into grow bed. I added a pound of red wigglers to the bed, which should reduce the amount of solid fish waste, since they feed heavily on the waste. Planting the bed full of herbs or other plants will have a significant impact as well. Over the course of the next few weeks I will drain the filter daily and clean the filter two to three times a week. I am hoping within the month this will clean the majority of the waste from the system and get it back in balance. Finally! Had a nice weather day and some actual time in between planned and unplanned projects to see how my bee hives looked. My one hive is empty because the bees swarmed last year and found a new home. I took it apart first just to see if I could determine any cause in the housing conditions to make them swarm. Threw away all the existing frames. Don’t want to transfer anything to the new hive. get any definitive information from the empty box. The pest’s that took up residence may have come in after the swarm, so I can’t really blame it on hive moths, veroa mites or other small critters. I may have inadvertently killed the queen at one stage last year and the bees decided to leave with the new queen they had grown. Who knows? I am throwing away all the “guts” of the hive and will burnish the interior of the hive body with a torch to be able to use it for my next hive. Hopefully this will kill anything that may have survived after the last bees left. So, on to the good hive. It has been thriving well. This is the hive I got 11 pounds of honey from last year. They seemed to over-winter well, but I felt I need to take the hive down to see what is actually happening. I put a honey box on top a couple of months ago because the weather has been strangely warm-and rainy-so I just wanted to see how it would go. Surprisingly, when I pulled the honey today, it was about half full and the majority of comb was drawn and ready to accept more. This may bode well for this years honey harvest in July. But my main concern today was to check and see that we had a good brood, meaning lots of new bees over the next few days. When checking the top box of the two deep hive, plenty of activity and lots of capped cells. So we should start seeing an explosion of bees in the next week! But maybe not…. The lower box was empty! I really was not expecting it to be empty, thought I might at least see some eggs or larvae. I went ahead and switched the two boxes positions (Since bees like to work their way up) and I will check it again next week to see if the queen is laying in the top box now. I am hoping that will be the case, so just have to wait and see. I will update when I get into the hive again. For now the hive is back together with the honey box on top—-fingers crossed.